Habersham County, GA — In May of this year, during a multijurisdictional raid in Habersham County several heavily militarized police barged into a home at 3:00 am because an informant had purchased $50 worth of meth from someone who once live there. During the raid one of the uniformed men, tasked with caging people for possession of substances the state deems illegal, threw a stun grenade into the crib of 19 month old Baby Bou. The raid was then justified by the Habersham County police despite Wanis Thonetheva, the man they were looking for, who didn’t even live at the house, not being there and no drugs or weapons being found. Also on this page Sheriff Joey Terrell claimed that Habersham County would pay the medical bills for the family. This was later proven to be a lie. Now, to add insult to literal injury, a Habersham County grand jury has decided not to charge any of the law enforcement officers involved in the botched drug raid. A 23-person grand jury apparently couldn’t find any criminal negligence on behalf of Habersham county cops. This decision was made despite the fact that Sheriff Joey Terrell claimed that SWAT had been staking out the house for days, yet still didn’t know there were children in the home. All they had to do was look at the minivan in the driveway with the stick figure family in the window. Or maybe take notice of the car seats inside. In the 16 page report presented by the grand jury on their findings, they found that “the drug investigation that led to these events was hurried, sloppy, and unfortunately not in accordance with the best practices and procedures” and that “the zeal to hold them [drug dealers] accountable must not override cautious and patient judgement.” Yet there is still, no crime. How can their be no crime in breaking into a house and throwing a grenade into the crib of a toddler and blowing his face off? Oh wait, “Because Muh Drug War”! 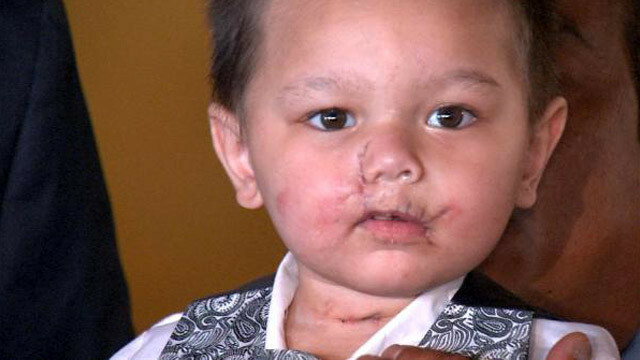 The jury also stated that they “heard the very real sadness, regret, and anguish in law enforcement officers who were involved.” Then they extend their sympathy, not only to the Phonesevanh family, but to the cops who blew a baby’s face off enforcing immoral laws for victimless crimes. This decision not to prosecute is a devastating blow to police accountability and it highlights just how far we have to go to end this ridiculous war on drugs.